The Region will be reconstructing King Street from Dover Street to Bishop Street in the City of Cambridge. This project will be divided into stages to minimize disruption to the public and businesses. Progress and major milestones will be posted on this project page. Please refer to the pictures page for maps showing where parking is available throughout construction. One lane of traffic in each direction will be maintained throughout construction. Construction began on Monday April 8th, crews are now setting up traffic control and starting removal of the benches, planters, trees and some sidewalk panels to allow them to set up the temporary watermain (blue pipe). This temporary watermain, once safely tested, will provide every property with water while we replace the permanent watermain. Thanks to everyone who participated in our Construction Launch Event! Cambridge Mayor Kathryn McGarry, Region of Waterloo Councillor Tom Galloway and Preston Towne Centre Business Improvement Association Chair Tony Schmidt provided some comments to kick off the project. Many thanks to Anubis Coffee Importing for hosting the event on a rainy Friday morning! Thanks to everyone who attended Open House No. 1! We had over 100 people sign the attendance sheet and a number of comments submitted by email or on the provided comment sheets. We are working to gather the information we need to answer the questions and have started to contact these people already. All of these links are also in the 'Important Links' section of this web page. We are having a second Open House to kick off the King St Reconstruction for anyone who was not able to attend the first event. Please join us at King Street Baptist Church, 361 King Street East, Cambridge to meet staff from the Region, the City of Cambridge, Navacon Construction and IBI Group. We will have plans and other project information available for viewing. Read this letter for an update on the selected contractor, working hours, access and traffic, parking, garbage and recycling, Canada Post and direct contact information of key staff members responsible for this project. Please use the subscribe button on this page to be notified of future project updates. We are having an Open House to kick off the King St Reconstruction. Please join us at St. Peter's Lutheran Church, 810 King Street East, Cambridge to meet staff from the Region, the City of Cambridge, Navacon Construction and IBI Group. We will have plans and other project information available for viewing. 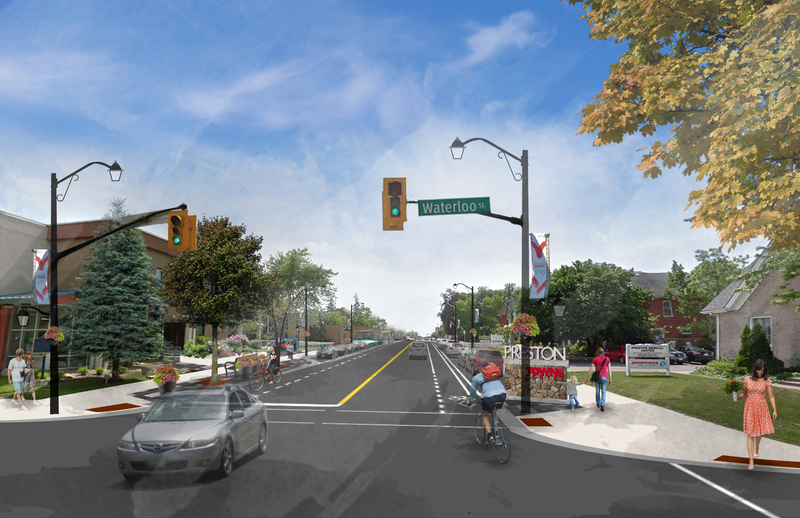 Why is the Region of Waterloo undertaking this project? What Improvements will be made to King Street? Who was responsible for planning these Improvements? How will the improvements enhance the pedestrian environment on King Street?